A young student, returning home to his small island community, uncovers murderous locals and a bizarre religious cult in Richard Rowntree's directorial debut "Dogged", which comes to UK DVD and Digital outlets this month. Student Sam (Sam Saunders) never liked living on Farthing Island, a remote community which is only accessable at low tide. But is forced to return home from Universitry on the mainland to attend the funeral of a family friend. Though he never liked Island life, having been away for some time he becomes convinced something isn't 'quite right' about the place and there something sinister lurking behind the friendly veneer of this deeply insular, christian community. However, I also felt that the film took way too long to get going and clocking in at just under 2 hours, did seem overly long. The story also seemed rather disjointed, as why would an island full of devout christians, also be indulging in pagan like rituals? Plus the story seems to leap forward at the end by an indeterminate amount of time which didnt make sense,, there was a couple of loose ends with regards to a couple of the female characters (unless I missed something?) and the ending just didn't 'sit right' with me (though can't say more without spoiling the plot). 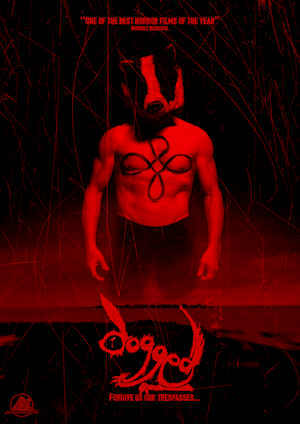 Anyway, "Dogged" hits DVD shelves and is available to view digitially in the UK from July 9th. I viewed an online version, no idea if the disc release will contain any supplemental material. If you like low budget thrillers, give it a go!